Choice of members: typically, about ten persons are selected first for the brainstorming session. On a specific day and time the selected persons are assembled in a closed room for one to two hours. Primary condition: The most important condition made clear to the group is to voice ANY idea on the topic of discussion, however wild the idea may seem. All are equal: In the session, every participant should be equal to every other with no inhibitions on voicing of thought due to rank differences. Outsider member: In addition to the subject matter experts, there should preferably be one outsider for contribution of fresh perspectives. The outsider may not be connected with the subject of consideration at all. Recording: One person in the group notes down every idea diligently and accurately. Idea screening and evaluation: After the session is over, the ideas generated are screened and evaluated by an expert group to reject the obviously invalid ideas and concentrate on more prospective ideas for further evaluation. Brain storming is a cheap and quick method for generating valuable new ideas for solving a particularly knotty problem. Because of the ease, in many cases when faced with a tough problem, organizations go for a quick brain storming session for finding a key innovative idea. Though brain storming is popular, chances of reaching a truly innovative solution through a brain storming session is at best equivalent to getting a lucky shot in a lottery. Furthermore, brain storming doesn’t enhance the inventive capability of a person in any way. It always is an one-off temporary affair. The term lateral thinking was coined by Edward de Bono to describe a kind of thinking which is different from conventional or normal thought. In conventional thinking (or which sometimes is called vertical thinking) we move forward along familiar lines using experiences and assumptions from similar situations. At each stage we build on the progress of the previous stage. We use the logic and the knowledge we have used before. It is a sequential step by step progress. Generally this is a logical and rational approach. However, sometimes following a conventional line of thinking we reach a blind wall. To cross the wall, according to de Bono, we need to forego the familiar path and approach the problem from a completely new direction. This is what he called Lateral Thinking. He evolved a system and along with it a large set of problems. Each of these problems was specially designed to defy obvious solution. His recommendation was to understand the need for out-of-the-box thinking and sharpen your lateral thinking skills by solving the problems. He devised training methods to increase lateral thinking skills of a student. The ultimate efficacy and success of lateral thinking methods were though doubtful, the contribution of de Bono in popularizing the need for thinking out-of-the-box can never be questioned. A few selected lateral thinking problems may give you some idea of the need for a different way of approaching a problem. Problem 2: What was the ancient invention? Name an ancient invention still in use in most parts of the world today that allows people to see through walls. How many grooves are there on an old LP record? To most people, none of these solutions will occur easily thinking in normal manner. We say, the solutions are chosen by the problem designer to be positioned in obscure non-obvious locations in the solution space. That’s why you have to think in special ways to solve these short but not to so easy problems. To give you a chance to devote some time on solving these attractive problems, the answers are given at the end of this discourse. The principles of Inventions already done can be used for a new invention. Altshuller analyzed 200000 patents worldwide, identified 40000 of them as original and through a great effort identified 40 guiding principles, one or more of which were used for any and all of the original inventions. For solving a problem inventively by generating innovative ideas using these principles and patterns, Altshuller and subsequent researchers formed a host of tools and methods which together formed the body of TRIZ. 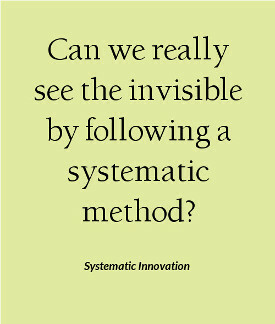 Today TRIZ is perhaps the only comprehensive empirical method for systematically generating innovative solutions. TRIZ is a large, complex but powerful system of creating innovation. An innovative problem solving in TRIZ can be carried out in multiple different ways depending on the type and complexity of the problem. We illustrate the use of TRIZ in a simple way through a few classical problems from TRIZ literature. TRIZ problem 1: How to fight a forest fire when you have nothing with you to use? TRIZ problem 2: What to do when in a hot kitchen stove the oven catches fire when you open the oven door? TRIZ problem 3: How to measure the temperature of a weevil? Weevil is a very small beetle and scientists wanted to study it. The first thing they noticed was lack of any information regarding the body temperature of a weevil. How to measure the temperature of a weevil? Do we have to design a special instrument? TRIZ problem 4: We have to place a large garbage bin on the roadside, but the space available is too small. Though from common sense you might answer some of these problems, knowledge of TRIZ inventive principles, specially the principle of using free resources will make reaching the inventive answer easier. These problems are constructed at the lowest level of TRIZ use. In more complex problems, effect of use of TRIZ methods and principles can be phenomenal. The answers and explanations are given at the end of this discourse. We consider the more involved methods of TRIZ to be appropriate for commercial grade innovation of high complexity where expected returns are also high. For daily life use we find the set of 40 inventive principles along with free resource use principle, time separation principle and Ideal Final Result concept to be of exceptional value. Understanding and judicious use of these TRIZ components in simple manner may accrue great benefits to daily life problem solving. Answer to problem 2: none other than our common window. Answer to problem 3: two for two sides. Answer to problem 4: those were triplets or quadruplets. Answer to problem 5: The surgeon was the mother of the boy. Answer to problem 1: Empty space is sometimes used in fire fighting instead of water and other substances. Fire fighters attack forest fires by building fire breaks or clearings where there is nothing to burn. The free resource of fire itself is used for the solution creating initially invisible empty space which the fire can’t cross. Answer to problem 2: The best way to extinguish the oven fire is to close the door calmly. When the oxygen is consumed, the fire will go out. We use the volume limit of oxygen as the free environmental resource here. Answer to problem 3: Just fill up a glass or a small plastic bag with large number of weevils and then measure the temperature with a conventional thermometer. In this solution, the TRIZ inventive principle of “Merging” is used. Answer to problem 4: In the inventive solution we use the space underground and hide part of the garbage bin so that its actual volume is large, but it does not seem to be large. We use the TRIZ inventive principle, “Use another dimension” here going 3D.